From the moment we wake to the time we fall asleep, we’re inundated with negativity. Want to watch some TV? You’ll witness some toxic stuff. Work at an office? No doubt there’ll be coworkers who exude negativity – a common occurrence in the workplace. 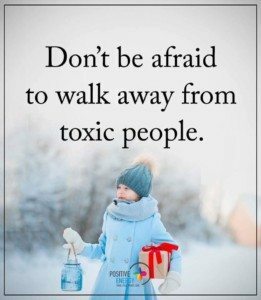 Toxic people are everywhere – and, unfortunately, there is no escaping that fact. This constant exposure to negative energy can leave one feeling confused, physically drained, and utterly frustrated. It may even result in a bout of depression, anxiety, or manifest into other mental and physical symptoms. Sadly, the number one source of negativity (by a longshot) is other human beings. Without properly dealing with such individuals, these folks can have a poisonous influence on anyone and everyone – and this is often their very intent. Toxic people come in all different forms: loud and quiet; angry and calm; intelligent and dull; eccentric and “normal”…and so on. Identifying a toxic person is not always simple, as many of these types are masters at manipulation. In understanding the different types of toxic people, we can effectively prevent or resolve any real or potential conflict. Identifying the problem is the most important step in solving it, and toxic people are no different. For some odd reason, many toxic people gain something by incessantly critiquing others. Chalk it up to poor self-image; the need to feel superior, or whatever – the reason behind it doesn’t matter; this behavior is as unacceptable as it is toxic. We all need people in our lives that will “tell us what we need to hear, not what we want to hear.” Such dialogue is called “constructive criticism,” and is intended to leave us better off. Toxic criticism does just the opposite, and should never be tolerated. Such people need to hear that their behavior is unwelcome and offensive, and then go about your day. Toxic people often seek out attention wherever they can find it. Others may just devalue your time; completely oblivious to the fact that you’ve got things to do. Both groups of people are toxic. People that waste time for no other purpose than to waste time are toxic; this requires us to set clear boundaries and to stand our ground. As fallible creatures, we’ll certainly disappoint others at one time or another. Perhaps more than one time – and that’s okay; unless disappointing others becomes a usual habit. Then it’s toxic. If someone in your life is repeating this hurtful cycle, it is time to do one of two things: (1) tell them you won’t allow it to continue – and if it does, (2) get that person out of your life. Many toxic people have a penchant for self-centeredness. Anything and everything seemingly revolves around them – and it never stops. “Self-redirectors” can be deciphered by their “taking” (as opposed to “giving) outlook on relationships. If it doesn’t benefit them, to hell with it. Most toxic people of this nature never change…so just let them go. The fifth sign pertains to people we choose to keep in our life, regardless of their attitude of indifference. When we love/like/care for another human being, and our feelings are not reciprocated by that person, it’s a hard blow. “Time heals all wounds” is an axiom that certainly applies in this case. You can’t force another person to care. Perhaps the best option is to let go and ride out the pain. It’s okay to be a bit envious of a person from time to time. However, when someone is always jealous, it’s tough to be in their presence. First, they’re almost never grateful for what they already have – and they make this known. Second, they’ll often vocally insult and disparage people who achieve any modicum of success. Finally, should you garner some accomplishment, it makes you an instant target. Needless to say, those who are excessively envious are toxic. Time to reconsider any relationship with this person. This is self-explanatory. People attached with the “Negative Nancy” label are seemingly always upset at something or someone. They’ll exude a sense of pessimism even if it seems completely unwarranted. 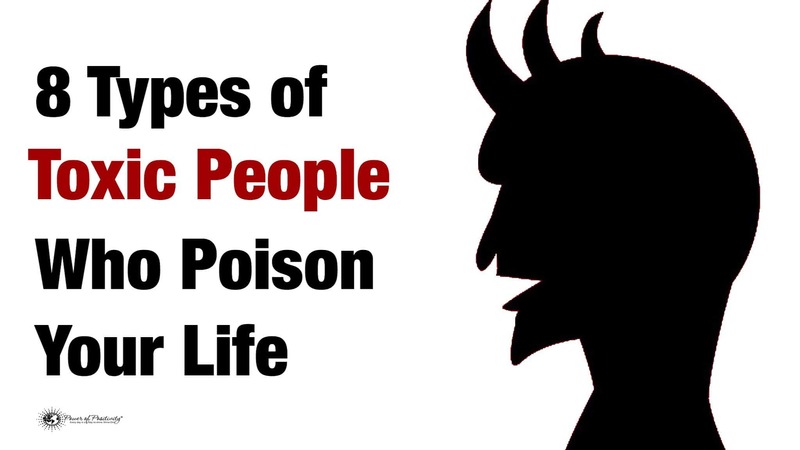 These people are extremely poisonous because negative energy is potent and permeating. We’re much more likely to develop a negative state of mind in the presence of such people. We need to get out of their presence. Refusing to take responsibility; constantly arguing with others; holding onto grudges; shifting blame to an innocent person. These are all common attitudes and behaviors of someone with a victim mentality. Not only is this an obvious indicator of an immature mindset, but it also has a toxic effect on others. Nobody wants to be close to someone who refuses to take accountability for themselves.